You can pick your own raspberries, walk your dog on a woody trail and sit around the campfire. 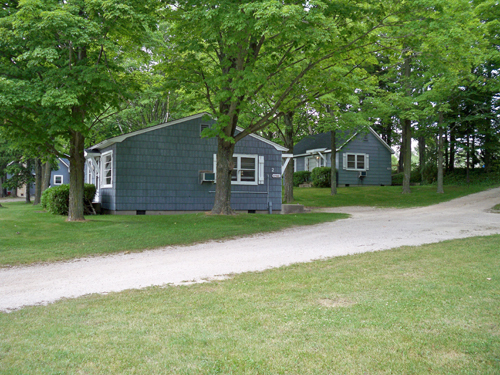 Cabins and motel - lots to offer! Indeed, you can do all this at Baileys Sunset Motel & Cottages. Gray buildings with white trim are nestled on a seven-acre parcel of land about one mile north of the Baileys Harbor shopping area and Marina. As you head north on Hwy. 57, Baileys Sunset will be on your right. Because the property is so big, you are set back from the highway. Your first stop is the building marked “office.” Just pull into the circle drive to check-in. All the cottages and motel rooms have lovely views. Black raspberries are ripe for the picking during late July and early August. And there are walking paths cut into the trees, so you can take a short hike with your dog, who is welcome here. The parking lot is huge, making this place a favorite among fishermen who love the space for parking and moving boats. Also, the owners even allow guests to keep fish in a big freezer in the office. And a modest continental breakfast is not offered in their lobby! We think families will be comfortable here as well. There’s a large playground area near the meadow, where kids can enjoy swings and a sandbox, volleyball net. Weber grills and campfire pits are available. If horseshoes is your game, you’ll be at home here as well. There a volleyball/badminton net, too. But if you’re more the indoors type, you can head to the games room, where you’ll happen upon board games and foosball tables. Brochures about the area are located here, too. Fun! When it’s time to relax, you’ll find your room clean, spacious and comfortable. You can choose to stay in one of the four cottages (some have one bedroom; others have two bedrooms) or in one of the seven motel rooms. And we think you will enjoy meeting Dave and Penny Geitner - Baileys Sunset Motel & Cottages has been family run since 2004. “Our mission is to give people a comfortable place to stay, and when you stay with us, you are family,” Dave says. All the rooms have small refrigerators, a coffee maker, TV/VCR. 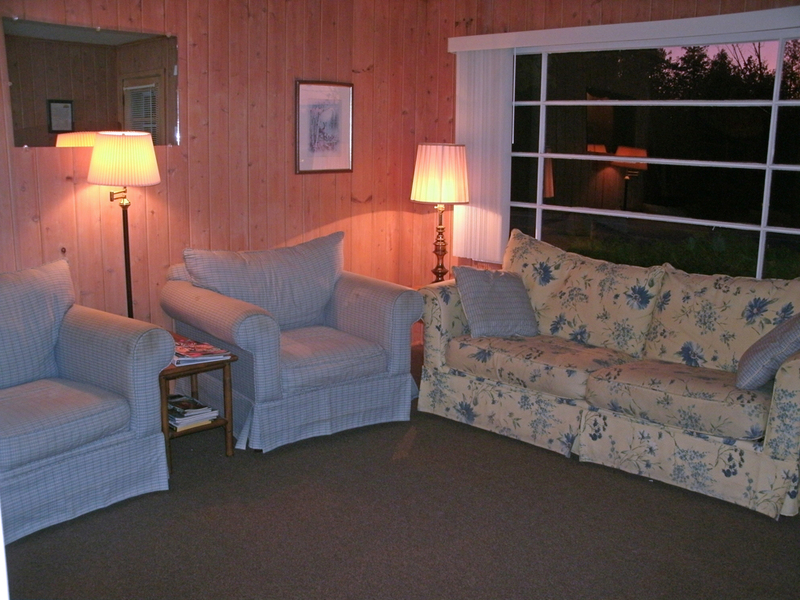 The cottages have a living/dining area, fully equipped kitchens (with pots and dishes and everything you need) and sofa sleepers in the living area. The one bedroom cottage we saw had a queen-size bed. We loved the vintage milk glass lighting fixtures. The two bedroom cottages include one bedroom with a queen-size bed and another with two twin size beds. Each cottage has one bath. 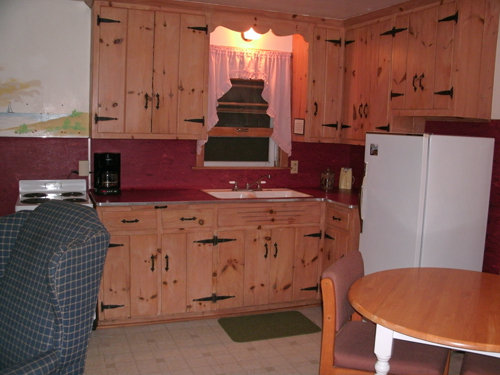 We enjoyed seeing the retro dinette set and the natural knotty pine kitchen cabinets and walls. 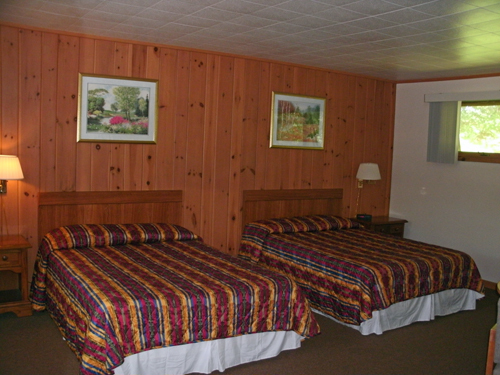 As for the motel rooms, you can choose from a room with a king-size bed, full-size bed or a queen-size bed. Dave says his guests have a feeling of being out in nature camping without having to bring a huge trailer along for the ride. You are just a mile north of Baileys Harbor, where there are boutiques, a book shop, restaurants, coffee shops and more. The Geitners maintain copies of restaurant menus and are full of tips—just tell them what you like and your budget. Nearby is the Ridges Sanctuary in Baileys Harbor. It’s a natural preserve, saved from a trailer park developer in 1937, and home to 25 native orchids and rare plants. 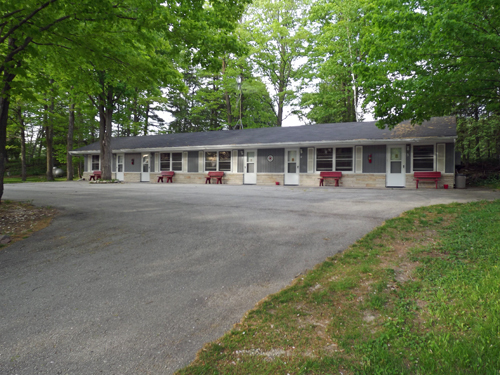 And when you decide to go to Baileys Sunset Motel & Cottages, please tell them DoorCountyNavigator.com sent you, and refer to Property ID# DCN-8404 .